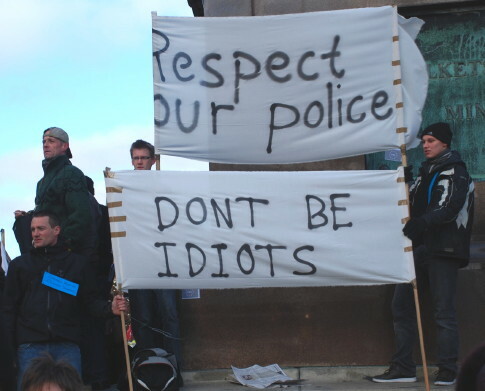 Social Forum Journey » Why is the left promoting police perspectives? What is clear from Kund Vilby’s open letter and the support of the police from Social democrats is that the question is not repression of the mass demonstration but how to relate to all the protests and policing during COP15. This is of course in the mind of every left wing group or party with ambitions to change society or become government. Consciously or unconsciously the Danish formal left wing organizations in their reactions on the repression of the December 12 demonstration had in mind the coming days during COP15 and especially the Reclaim power action which they all had opposed. All formal Danish voices from any kind of strands that had been raised with the exception of Attac in the last minute had claimed that the action was impossible in Denmark on moral grounds. The reason for this was that civil disobedience even if non-violent directed against a legislative assembly was of such a different nature than other civil disobedience against more acceptable goals to the public like shutting down a coal fire plant or organizing a picket to stop privatization of services. Attac changed their mind after that it became clear that in 2002 such an action had been successfully carried out during an EU-Summit at the Bella Center without escalating into violence. There was also a second reason shared by many more including those that could see no hindrance in principle towards non-violent actions at legislative assemblies like the parliament, EU or UN summit. This reason was the fact that there was an additional reason to protect the Bella center compared to many other targets, a cause behind a police action. The politicians inside were known goals for terrorists and thus extraordinary ways was necessary to protect them. As one commentator summed it up in Politiken afterwards, the whole action was totally unacceptable as a murderer could hide among those pushing for coming inside. The argument that terrorist attacks of this kind never have happened during summit protests is no reason for disclaiming this argument. The police are anyway in their full right legally and morally to act as if such a possibility could be a reality. That some arguing for the action at times were not aware of the seriousness did not make the situation easier. It had been stated once at a CJA preparatory meeting that there were no risks for getting shot by security guards as inside the Bella center were tens of thousands of delegates and so there were security measures in many layers before it would be possible to reach the persons that needed special protection. This was of course partly true and an argument against the somewhat exaggerated opinion in Politiken against the action. On the other hand also naive. There were no reason to believe that the police or other security forces would regard reclaim power activists whether in a main bloc or separate affinity groups as the same as NGO delegates once they had overcome the first police barriers and further closer to the building at the entrance at the subway were the NGO delegates entered or elsewhere. On the other hand this was also an argument for that establishing a People’s Assembly inside the Bella center area which was in practice done at the EU Summit 2002 after pushing the police a bit did not pose a security threat to the well protected inside. 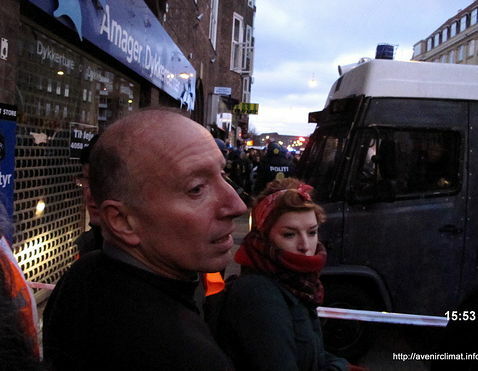 There were not only many security barriers inside the building but also many barriers to overcome if the mass action had overcome the first police cordon. There were at times an omnipotent language in the CJA preparations talking about disrupting the official conference for a whole day unspecified in what way by entering from outside and with the help of those inside making it unclear what the goal of the action was. To disrupt COP15 by establishing inside the Bella center area a People’s Assembly by the force of mass civil disobedience from the outside and with NGO and governmental delegates from the inside calling for a different agenda than the official. Or to disrupt the conference also physically inside the venue coming from the outside. Closer to the date for the action the goal to establish a People’s Assembly became more and more clearly expressed and both for this reason and that other goals were practically out of reach for the action arguments against Reclaim power became more and more invalid if taking into consideration the gap between the official arguments for the acute need for action on climate change and inability in the negotiations visible since many months or longer of that negotiations would fail. What made the formal Danish organizations, many of them claiming to be system critical, anyway almost in unison totally reject the Reclaim power action in spite of the predictable failure of the conference and that the formal organizations claimed that another agenda was utterly important is of importance to find out. Are the Danish formal organizations less interested than they claim in a politics that can stop climate change? Are they seeing other more ideological goals as more important as the idea that all legislatives assemblies should for ever be excluded from any civil disobedience regardless of what decisions are made inside? Another possibility is that the formal organizations do not trust people. Vilby may not be alone in his prior assessment that without leaders a mass non violent action may go out of hand. Is it out of question to take any risks for a formal Danish organisation were its leadership might need to answer on why they were so naive believing that people in common could be disciplined during a mass action were the police might provoke in different ways? The other option was to play safely and unite with main stream NGOs stating as a main message from the 12 December demonstration the by December illusionary wish for a real deal with a secondary main ideological message, trust the leaders. This secondary main message was in total opposition to the message from the reclaim power action. Faced with this reality the most resourceful left wing actors makes the choice to support a view in favour of a police perspective on what happened at the demonstration 12 December. Furthermore is no collective response organized among formal Danish organizations against the police intervention by the left wing parties supporting the integrity of the demonstration. The first reaction among the left wing parties is to internalize the views of the police, even more actually than the police themselves. The story that the mass arrests took place after a policemen was hurt by a stone is made up by the media and the left wing parties, it is not in the official police statement explaining the reason for the action. The Danish organizations gets paralyzed by the fact that they have made a choice. They are against questioning the official summit by non violent disobedience and have all instead opted for a broad mass demonstration. Then they have to follow the line completely and use the same arguments against the integrity of the demonstration as they use against the reclaim power action. Demonstrators in any kind of manifestation are dangerous and we need to understand that the police must intervene as the risks are far higher than we can imagine. If they do not exist we must help by telling that the risks in anyway existed and thus the reason for the police to intervene was by all means understandable. Citizens against activist violence demonstrating in the middle of the gathering of the demonstration. By internalizing a police definition on violence and reasons for intervening the formal Danish organizations becomes as integrated into the state as the main stream NGOs that chose to say no to participate in supporting a people’s climate forum in Copenhagen as they had all access to influencing the summit from inside the Bella center as accredited lobbyists. But the internalizing of the police definition of violence is more hidden. Those controlling system critical media are often strongly related to the same organizations that as in Denmark have chosen to support the police, at least in the decisive moment. There is much at stake for the formal organizations and thus they try as much as possible to act behind the scenes instead of openly. 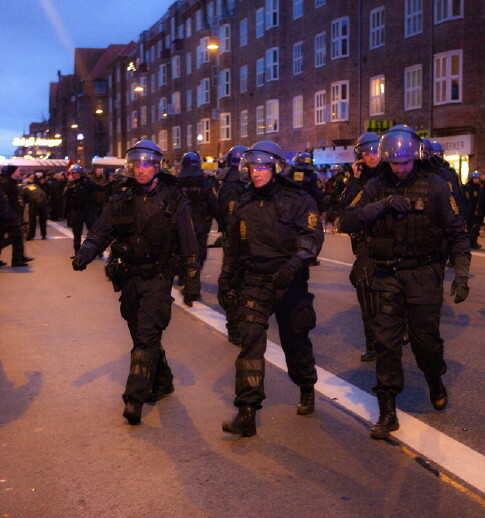 But what happened in Copenhagen is historical also in the way that this time it became obvious how this internalization of the police interests is expressed and organized. The key argument against the Reclaim power action was that any kind of pushing a policemen at the Bella Center would immediately result in violence, and violence is if it is executed by the police or a demonstrator totally unacceptable. As the non-violent person pushing a policemen is the cause of this predictable violence this action must be totally rejected. There were more or less no objections to the political demands of the reclaim power action from organization demanding climate justice, only this that the violence that would occur due to an action at a legislative assembly was impossible to explain to members and the public and also to many morally unacceptable.